March has been a mixed bag of a month. Between Daylight Savings, the fluctuating weather, and other circumstances, I wasn’t sleeping well for awhile, but now I’ve more or less adjusted. My comics backlog has grown bigger thanks to a big shipment of manga from Right Stuf, a couple of used bookstore pickups, and the arrival of a certain long-awaited graphic novel. I’ve also started trying out some new recipes for a change. As for gaming, that’s been going more or less okay since my last post here, and the games themselves have been about as much of a mixed bag. I beat Disgaea 3; the ending was all right, though since learning that the sidequests are as grindy as expected, I officially put it down not long after. Before that, I went back to and finally beat Legend of Dungeon, using a class I hadn’t given a second thought to before; it’s still not at version 1.0 yet, but I’m just glad to be done with a second roguelike/like this year. Speaking of which, I took up Spelunky again and made quite a bit of progress, though it will be a long time until I actually beat it. In addition to continuing on with Bravely Default and picking up Dance Dance Revolution SuperNOVA 2 again, that about wraps it up for February. Moving on to March, the first game I beat this month was the hot new release Firewatch. It is a beautiful and (mostly) well-crafted game, though a little bit of a victim of its own hype. The story is not mind-blowing but still decent; the save system leaves much to be desired; and the characters, music, and so forth were well done; but the real star in this game is the environment. 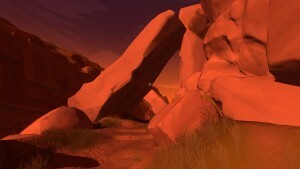 Firewatch is set on a small parcel of US National Park land, and each little area within is distinctive in many ways. Aside from the climbing rocks (which are especially gamelike in a certain part), the wilderness here feels like a real place, and is easily the best thing about Firewatch. This was not, however, the first game I started in March. That honor goes to Pokemon Blue Version, which, along with Red and Yellow, came out on the 3DS Virtual Console on the date of the series’ 20th birthday. Pokemon’s first generation is the only one I hadn’t played in some form, and, given how pricey original cartridges of that gen and its remakes can be, was one I hadn’t planned on ever playing until the Virtual Console announcement was made. I’m currently up to three gym badges and am not far from getting the fourth. It’s been interesting to see the roots of the series: the Pokemon, items, gyms, HMs, and all the other little things one becomes accustomed to seeing in the games. Some of the things that were different were just as surprising; for instance, most of the Pokemon don’t have listed genders, nor is the indicator for whether or not you’ve already caught a certain type present. The player character’s rival is also far more obnoxious than they would be in later series entries, and there is also a greater emphasis on filling up the Pokedex. In general, it’s all still both fun and tedious in its telltale ways; twenty years on, the core of what makes Pokemon Pokemon hasn’t changed much. Next up would be the third RPG I’m currently playing: Diablo III, via the Ultimate Evil Edition on 360. After trying out a handful of different classes, bitprophet and I settled on a wizard and a monk (respectively) and started our adventure to investigate a fallen star and the prophecy it portends. It’s the loot-heavy, lore-heavy action RPG that you’d expect, and it’s looking to be quite long, as well. Needing a break from RPGs for a little while, I recently started delving into some shorter games in other genres. First up was Hatsune Miku: Project DIVA F. This was my first time playing a Hatsune Miku Project game that’s specifically in the DIVA series, and, sadly, it was not as much fun as Project mirai DX. The difficulty is brutal, the small button icons can frequently get lost in the music video chaos on-screen, and there’s a handful of aesthetic issues that prevent me from enjoying it as much. Chief among these is the tracklist, which is on the weaker side overall, and weighs heavily on more offbeat songs toward the end. A lesser quibble I have is that the “modules” specific to each song are locked from the outset, which means Miku and company perform in their default outfits whenever a track is played for the first time. This is okay for many tracks, but does not work as well with others, especially the elaborate period piece “Senbonzakura”. After unlocking all the songs on Easy, I was ready to set Project DIVA F aside and move on to something else. The next day, I started Kero Blaster, which is by Cave Story‘s Studio Pixel. It’s much more linear, for better or for worse, than Cave Story, and also more lighthearted, but maintains that same feel otherwise. The characters are all down to earth, moving and shooting are handled well (there’s even a bubble-based weapon that’s actually useful), and the levels are sufficiently challenging. I highly recommend it to anyone who likes old school-style “run and gun” side-scrolling games, and to fellow Cave Story fans especially. There are also two (very charming) free games, titled Pink Hour and Pink Heaven, that serve as demos of sorts for Kero Blaster, though you could also play them afterward, as I did. Finally, there’s the two classic titles I started yesterday: Professor Layton and the Curious Village and the HD version of NiGHTS into Dreams… The former is my first Layton game, and might also be my last; it’s decent for what it is—a collection of brainteasers in a story wrapper seemingly inspired by European comics—but I’m not exactly hooked. I’m only about a couple of hours in, so maybe I’ll change my mind later on, but I kind of doubt it. Meanwhile, NiGHTS, which I ended up beating earlier today, is a slick-for-its-time 3D action experiment. Its so different from any other game that’s been made, I’m not sure if it has aged poorly or well. The camera’s a little iffy (though not as bad as in certain later Sonic Team games), the story’s more convoluted and strange than average, the routes through the levels can be tricky to navigate, and the game as a whole is short, but it’s got a certain flair which makes it impossible to dislike. 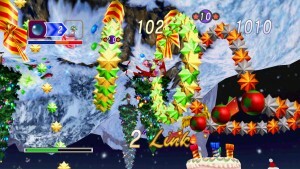 Even more appealing is an unlockable bonus in the form of Christmas NiGHTS, one of the most famous and unique game demos ever made. This demo takes one of the first stages of NiGHTS and dresses it up with a Christmas theme, complete with a separate story to go along with it. 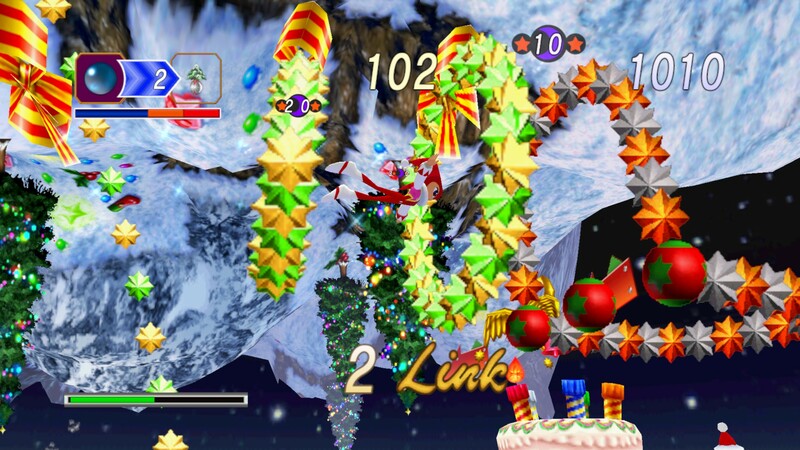 Unfortunately, unlike the main game, the original Saturn version of Christmas NiGHTS is not included as a playable option. That’s about all I’ve been up to lately, gaming-wise. With Kero Blaster and its spinoffs, I decided that it might be a good idea to dedicate my weekends to an indie/doujin game (or two) of a reasonable length, which would help me churn through more of my backlog, at the very least. At the moment, I’m considering my options for this coming weekend, and there are a lot of them. I should also get back to the RPGs in between those indies and sessions with Professor Layton. One of my major backlog goals for this year is to put a dent in the number of RPGs I have sitting around unplayed, but I was not expecting Bravely to be this long. Perhaps I’ll have it beaten by next month. Either way, I have no idea which RPG I would want to play next.